Everyone should know how to boil an egg, it’s a cooking basic right? Or maybe not. Several years ago in Hawaii I wanted to boil some eggs for tuna salad. I suddenly realized that whenever I’d done it at home, I had a nifty little boiled egg timer that my mom used. With no timer, and no money to buy one, I turned to the one source I knew could tell me how long to boil an egg. I called my mom! My mother is one of those people who seems to know everything, not thinks she knows everything, she actually knows just about anything you could ask her! I call her up and she tells me, oh it’s easy! I think she was mostly thrilled that her at the time estranged daughter was actually calling her on the phone. (We have a great relationship now fortunately). She gave me step by step instructions, and over the years I’ve used those (and probably adapted them slightly) to get perfect boiled eggs every time. The term “boiled egg” is actually misleading, because if you really boil them for very long, they bounce and crack and you get a scary deformed egg like the one below. 1. Place eggs that are at least 5 days old (NOT fresh from the farm!) 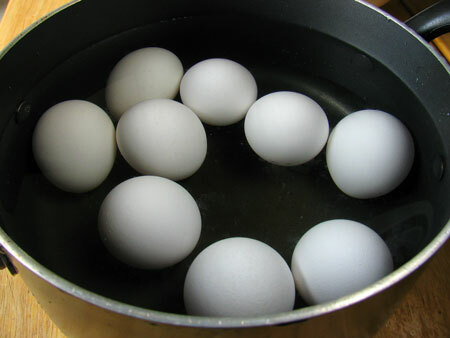 in a single layer in the bottom of a pot, and fill the pot with water that covers two inches above the eggs. 2. Place the pot on the stove and turn the burner to high. You can walk away for a few minutes but make sure you check on it to see when it begins to boil. 3. Once the water starts boiling, PUT THE LID ON THE POT (can you tell that’s important?) and take the pot off the stove. 5. When the timer goes off, your eggs should be done. Use tongs or a slotted spoon to remove eggs from the hot water. 1. Pierce a small hole in the tip of the egg before boiling. You can use a pin, but I use the egg piercer in my slicing gadget. 2. 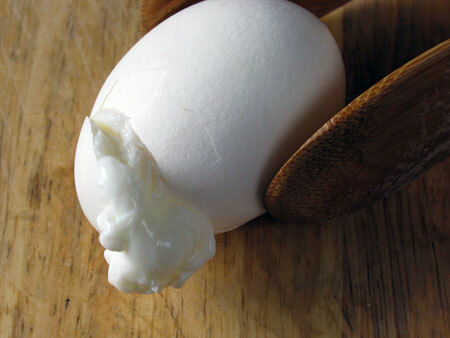 Add a teaspoon of vinegar to the water, this is supposed to help keep egg whites from leaking out if the shell cracks. Boiled eggs are so handy, and I have lots of recipes to use them in! Like Egg Salad, 1000 Island Dressing, Tuna Sandwiches, or (my favorite) a Thai recipe called Son-In-Law Eggs. Tonight, I’m just eating one with a little salt. Do you have any other tips to getting perfect boiled eggs? Everytime I make hard boiled eggs I have to look it up, I never remember the timing! 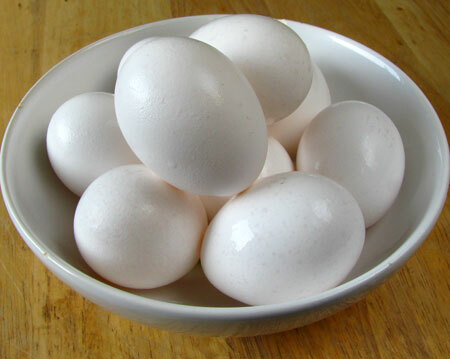 A well-cooked hard boiled egg is so wonderful. Great tutorial on something that seems so basic, but can really be a disaster if you don’t do it right! No matter what, I always have trouble with the peel, I’ll try timing them next time. Crystal, I promise there’s several recipes for you coming up, from the basic egg salad to the more exotic 🙂 Oh and I’m so excited you’re preggers! Sarah, getting lots of steam under the shell is the key to easier peeling. Time it and then immediately run under the cold water, or even put in an ice water bath! This creates the steam that helps separate the membrane from the egg. THANK GOODNESS FOR MOMS. Awesome post–this is how I do mine! SO easy! Mmmm, cannot wait to see what you use them in! For those who like kitchen gadgets, this little thing works like a charm but you do have to keep an eye on it to watch it changing colors. I used to always have green rings around the yolks before I got one. Why can’t you boil farm fresh eggs? They’ll be impossible to peel. Eggs need to be at least 3 days old to hard boil if you want to be able to get the shell off. here’s another tried and true hard boild egg method: cold eggs in warm tap water. put on high heat and start 12 minute timer just when the water boils. reduce heat half way between high and med/high and hit timer. at 12 minutes have your mits on and slide the hot pot off heat. when boiling stops you can move to sink and run cold water over the eggs till you can touch the water with bare finger. yes let it overflow the eggs about 30 seconds and you’ll be fine. now grab the eggs and start smacking them against the sink; both ends and around to break shells. first broken chip you remove the whole shell will easily slide right off. I do a dozen at a time for salads and Son in Law Eggs and this method never fails. if you boil them longer and don’t immediately cool them the opposite happens; the shells stay near permanently attached to the eggs. No Yolk ladies and gents. I’ll have to give that a try, thanks Dave!